What you'll do with your ten acres is up to you. Horse corrals, your own ORV run or whatever your envisage. This is big sky and wide open California Desert. Remote enough to be away from crowds but close enough for all the essentials. Dark skies at night provide nightly celestial shows while clear skies can be counted on any day of the year. 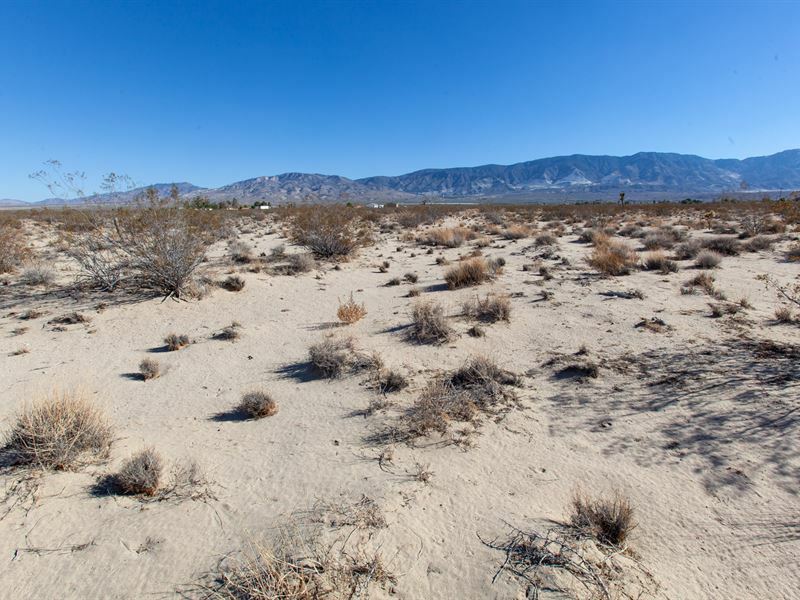 Lucerne Valley offers a mid point between remoteness and access to basic necessities while maintaining affordability hard to find in Southern California. All the while it is a short hop to other recreational opportunities. Located less than ten minutes from downtown Lucerne Valley where there is a supermarket, hardware store, post office, sheriffs office a gas station and a variety of restaurants. And you're a half hour to Apple Valley and St. Mary's Hospital and a broader variety of services. There are, of course, a number of schools and churches in this area as well. What is more is that you're very close to a National Forest and you're less than a half hour scenic drive to Big Bear on a route that never has traffic and is one of the routes that people take if the other major routes are snowed down. The Pine Trees and Lake is close enough to make it easy to shoot up there at a moments notice for fishing or a meal out. You'll also pass by a major ORV / camping area on the way there. And you're just an hour from Joshua Tree National Park and 3 hours to Vegas. Getting there, the Hwy 18, the 247 (Old Woman Springs Rd) and Camp Rock Road are all asphalt and well maintained. The roads off of Camp Rock Road are dirt county roads and county maintained. Off of Camp Rock Road you take Foothill road West for 1/4 mile and turn North on Palomar Ave for 660 feet. Foothill is well maintained and Palomar less so, but still adequate. In fact, for years the county has been saying they will pave those roads - and I suppose someday they will. This is level ground and readily buildable. The water table here is only 230 feet and power lines run to the adjacent property with the nearest pole just 500 feet away. There are also gas lines running through this area. Of course, this is a septic tank area. In short, this location provides the Big, Big Acreage (at a low, low cost) for a residential opportunity that still puts you close to the things you need and want. Here you'll find the solitude and freedom as well as clean air and absence of congestion that perhaps you lack in your current location. In fact, the parcel is so big you'll have room for your own recreational opportunities: maybe your own ORV track or horse corral or whatever it is you have in mind. Consider this your chance at your High Desert future residence. Call or text me at the number listed or email me with any questions you might have. This property is easily affordable and sells for less than comparable properties. On top of that we can offer seller financing to make it even easier.